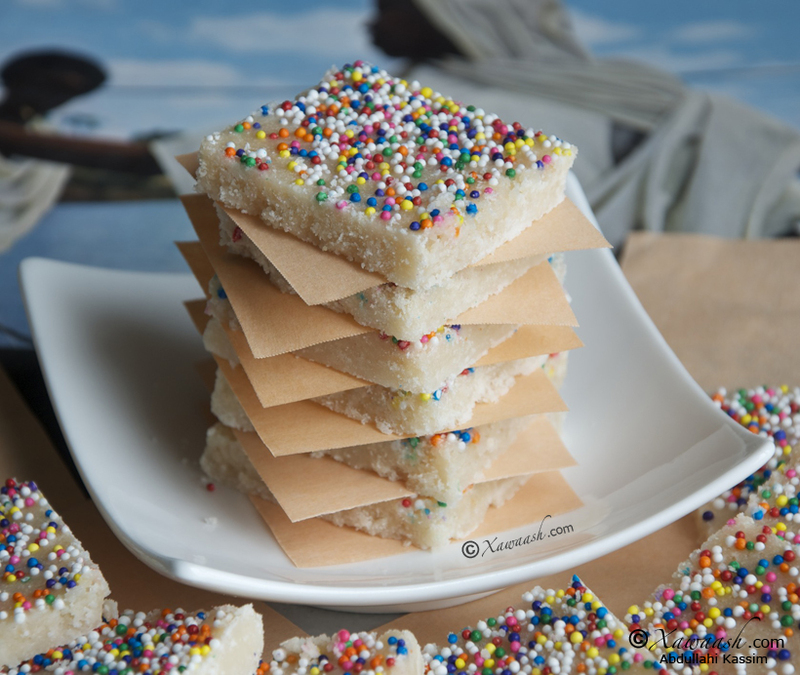 This is one of the most requested recipes and it is a popular sweet in Somalia. 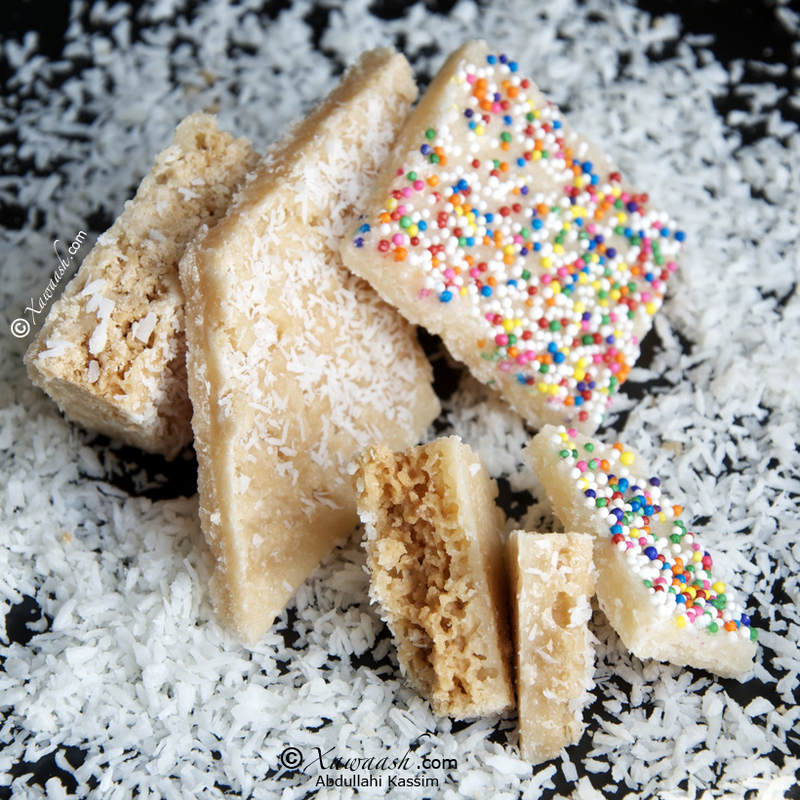 Unlike the previous recipe that we posted for Coconut Sweets, this one is more like candy and it is easy to cut into any shape you desire. When we set out to make this recipe, we remembered a wedding we have been to where they were included as part of a package of different types of sweets that was given to each guest. We liked them very much and lucky for us, the person who made them was our friend, Zeinab Ahmed. She came over and prepared this recipe for us. There was one minor issue, however. Only she knew how to make these sweets and she told us that whenever she taught someone, they were unable to make them on their own. Some have even borrowed the cup she used for measuring the ingredients, the pot she used for cooking and even the spoon that was used for stirring. Of course, none of those helped. Under her guidance, we measured out the ingredients to closely match her measuring cup (she did not bring hers), and we timed the recipe. The first attempt was not successful. She tweaked the measurements and adjusted the cooking time and voilà! The second attempt was successful. The next day, we made the sweets on our own and they turned out perfect. Then we started experimenting. First, we added mint extract to the ingredients and we liked the result. Second, we tried increasing the cooking time by a couple of minutes to make the coconut sweets more crumbly, and that also worked out very well. We didn’t add mint extract to this version. We prefer to add cardamom instead. 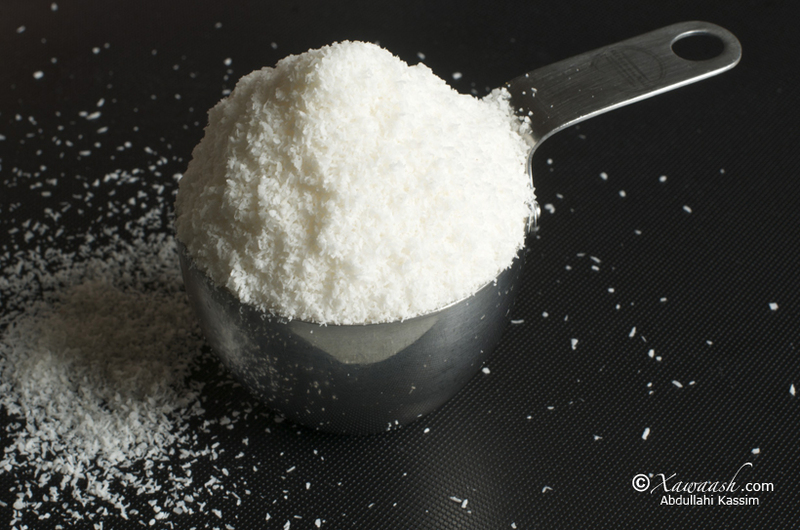 To give the sweets more coconut flavour, we sprinkled finely shredded coconut on top of the sweets. These sweets allow many possibilities for experimentation. One thing we would like to try the next time we make them, is to partially dip them in unsweetened chocolate. The mint and chocolate will be great together and the sweets will look very pretty. Cette recette est l’une des plus demandées et c’est une confiserie populaire en Somalie. A la différence de la recette précédente des bonbons à la noix de coco que nous avons publiée, celle-ci ressemble plus à un gâteau et il est plus facile de découper des formes différentes. Quand nous nous sommes préparés pour faire cette recette, nous nous sommes souvenu d’un mariage auquel nous étions invité où ces bonbons étaient inclus dans un assortiment de sucreries qui étaient offert à chaque invité. Nous les avons beaucoup appréciés et nous avons la chance d’avoir pour amie la personne qui les a faits, Zeinab Ahmed. Elle est venue à la maison et a réalisé la recette pour nous. Il y eut juste un petit problème. Elle est la seule à savoir faire cette confiserie et elle nous a confié que à chaque fois qu’elle l’apprenait à quelqu’un, personne ne pouvait refaire la recette par eux-mêmes. Certains ont même emprunté son verre doseur pour les ingrédients, la casserole qu’elle utilise pour la cuisson et même la cuillère qu’elle utilise pour touiller. Bien sûr, rien n’a aidé. Sous sa direction, nous avons mesuré les ingrédients comme avec son verre doseur (qu’elle n’avait pas amené), et nous avons fait attention au temps de réalisation. La première tentative n’était pas une réussite. Elle a alors ajusté les mesures et le temps de cuisson et voilà! La deuxième tentative était un succès. Le jour suivant, nous avons cuisiné la confiserie par nous mêmes et ils étaient parfaits. Puis nous avons commencé les expérimentations. D’abord, nous avons ajouté de l’extrait de menthe aux ingrédients et nous avons aimé le résultat. Ensuite, nous avons essayé d’allonger le temps de cuisson de quelques minutes pour rendre les bonbons à la noix de coco plus friables, et ça a bien marché. Nous n’avons pas ajouté d’extrait de menthe dans cette version. Nous préférons ajouter de la cardamome à la place. Pour renforcer l’arôme de noix de coco, nous avons saupoudré de la noix de coco râpée très fin sur les bonbons. Ces bonbons permettent de nombreuses possibilités d’expérimentation. Ce que nous aimerions essayer la prochaine fois que nous les cuisinons, c’est de les couvrir partiellement de chocolat noir. La menthe et le chocolat vont très bien ensemble et les bonbons seront très jolis. 1. Verser le lait dans une casserole de 3L et chauffer à feu moyen. 2. Ajouter le sucre. 3. Mélanger. 4. Après 8 minutes, ajouter la noix de coco râpée. 5. Continuer de touiller pendant la cuisson. 6. Ajouter l’extrait de menthe. 7. Le temps de cuisson total est de 15 minutes. Verser l’appareil sur une surface huilée. 8. Ajouter les confettis immédiatement. 9. Après 2 minutes, découper en formes de son choix. vide-ka hadan arkay walaaliyaal ,,, youtube marki hore ka raadinayay. thank so much A&L iam going to do it today and let you know how it turn out. this is a fantastic recipe,i tried some of ur recipes it turn out great,if u have any fried shrimp or chicken,im waiting for shrimp recipes,by the way a&l the yeasted cake its little burn in the muffin pan. i usa the sandwich toaster its turn out great,back at home we have same cake we call adda we use jaggery to get the colour and coconutmilk.once again im thanking for u a&l & ur familey u guys put such trmandous effort what u guys doing,thank u from bottom of my heart. may allah give u live long,im very fond of ur blog everyday im looking for anything new.keep up the good work guys.catch u later bye love ur cooking. Thank you very much for your nice comment and kind words. We also like shrimp and we will add fried shrimp to the list. When baking, if you use a small baking pan you have to adjust the baking time. Mansha Alah A&L aad iyo aad ayad u mahadsan tihin, Ilahayna khayr aan dhaman ha idinsiyo idinka iyo rerkinaba. walalo wakan qumbihi aan idinka codsanay, aad ayan ufarxay marki an arkay hada ayn samynaya hadi ilahay yidhahdo .you guys have amazing talent, you made us want to be chefs. I am always on your website, it’s very enjoyable. Thanks for taking the time and effort to make these recipes and video’s for us. Walaal Khadija khayr badan ayaan kuu rajaynaynaa. Hadduu Ilaahay idmmo Recipe kale oo qumbaha la jarjaro ayaan soo gelin doonnaa. Waad ku mahadsantahay faallooyinkaada fiican oo aad marwalba noo soo qortid. Salam, thank you very much! Was looking for this recipie. Can’t wait to make it…I have made other dishes from xawaash and they are always a hit with fam/friends. Jazaka’Allah khayr for this website! Somali cuisine is alive and well. Thanks again, Wasalam. Thank you very much for the very nice comment. We have more coconut recipes and hope to post them soon. Hi Sofia, we used 2/3 cups coconut. In the video also it’s the same we used 2 x 1/3 cups (two times a third cup) which is 2/3 cups. We tried increasing the coconut but it didn’t set or solidify. As for stickiness we believe that the heat you used was lower than what is required. You can either increase the heat or cook it for a longer time. Aamiin. Waad ku mahadsantahay faalladaada. Aad iyo aad ayaad u-mahadsan tahay. Mandarka qurux waa wax aad u-qalantaan, waanna ku faraxsan nahay inaad jeclaatay. Qumbaha aad ayan uga helay waxana raba in aan sameysto lkn Meento maxa laga wadaa adinkoo mahadsan ? Meento waa caraf sida vanilla-da oo kale. Nacnaca ayaa lagu daraa, cabitaanna waa laga sameeyaa. Af-Carabi waxaa lagu yiraahdaa نعناع. Af-Ingiriisiga-na waa “mint.” Mahadsanid. Djazak allahoe ghairan! Thank you so much for posting this recipe! Xawaash has the best recipes. The qumbe cad was so good, that I made it twice haha. I can’t wait for more qumbe recipes! We have three more sweet coconut recipes lined up for you. Waxaan ka cabsanaynaa inaad Qubaha sanka ka-keentaan. We definitely want more recipes! Excellent excuse! Look out for more in the upcoming posts. Thank you. Waan ku faraxsan nahay inaan waddanka ku soo xasuusinay. I would like to ask you if you know the ingredients about macsharo or mash mash. is hand flat white things. We used to eat at ramadan time. If you have that recipe. could you send me plz? We are in the final stages of testing a recipe for mashmash. Hope to post it soon. Koob cabirkiisa yahay 237 mL waa inaad isticmaashaa ama miisaan sokorta iyo qumbaha. Caanahana waa inay noqdaan 200 mL. Cabirada hadday wax ka-qaldamaan qumbaha ma-hagaagayo. Masha Allah and barakallahu feekum, great site and hope you guys continue with it. I am already calling and sharing it with everyone. Thank you very much. Jazakillah khayr. Bur kuma darin. Cabirada ku noqo, sokorta hadday kuyaraato isma qabanaayo. Hadduu Ilaahey idmo nooc kale ayaan soo gelin doonnaa. Aad iyo aad ayaad ugu mahadsan tahay faalladaan aadka u fiican. Wey kala yaryihiin 1 dL wuxuu u-dhigmaa 100 mL. Mahadsanid. Waa laga samayn karaa laakiin waxaa ku-fiican midka shiidan. Su’aalihiina waan jecelnahay. Waxay nala tahay cabirka sokorta inuu kaa qaldamay ama caanaha iyo qumbaha inay ku-yaraadeen. Waad ku-mahadsan tahay su’aasha. 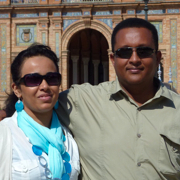 Meenta waa caraf sida vaniilada oo kale. Af-carabiga waxaa loo yaqaannaa nicnaac. Hadduu Ilaahey yiraahdo waan soo gelin doonnaa ee wax yar inoo samir. Yes, you can use dessicated coconut. You should get the same result. I was reading one of the other comments of one of your readers. I also had the same issue with the coconut. I have an electric stove and I set to to medium. I used 2/3 cup of coconut and it did solidify. But the amount of sugar (2 cups) to coconut is really high thus it turned out like a sugar fudge. It wasn’t sticky at all it seems like when you bite it it just taste like a bar of pure sugar with flavor of coconut. So I don’t what to do next, maybe I will try to increase coconut (double it) and also decrease the sugar by a cup. I will definitely let you know how it turns out. Also I have made this before with “old recipe” I had -just using a can of condensed milk, and coconut. Then it bubbles and comes together and then pour in a pan voila it sets like bars. It’s slightly chewy -but depending how crunchy or crumbly you want it -you can cook it longer. This recipe is for Kashaato. Saying that it is too sugary is akin to saying Halwo is too sweet. This is the authentic and traditional way it is made. 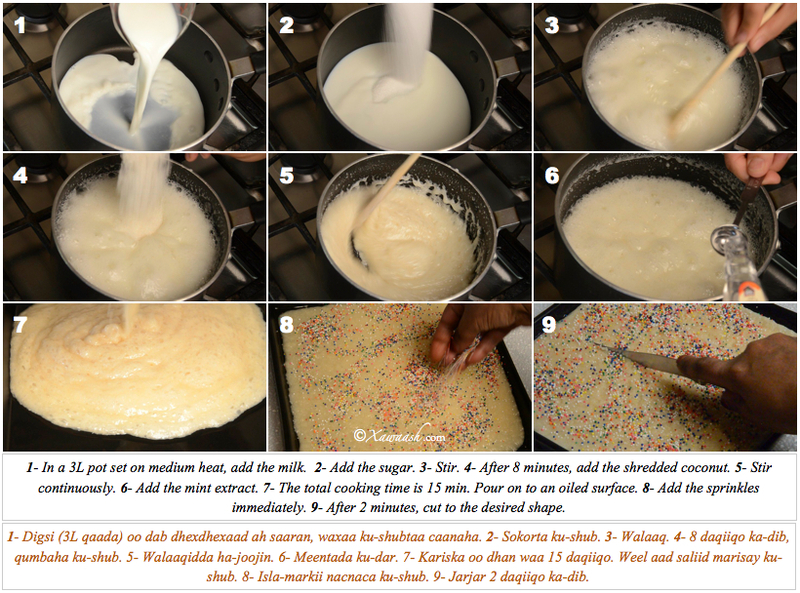 The other method that you described does not give you Kashaato, but it is similar to the Coconut Burfi we made. In order to cut the sweetness of the Kashaato, we added mint extract. We also sprinkled it with shredded coconut to accentuate the coconut flavour. I tried to adjust it and it was a total failure! oh my god. But I did how ever keep the original recipe. I stored them in jars and I hope my my brothers and sister will eat it. 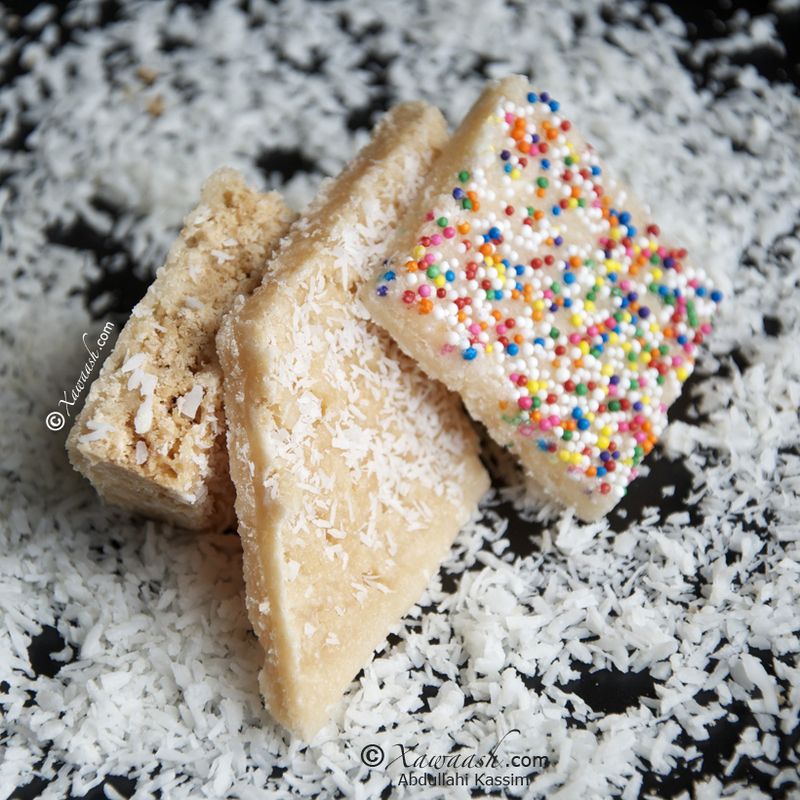 But to my taste I would prefer a bit more coconut and less sugar so I will go a head and make the coconut burfi for myself. Thank you for your quick reply! There are recipes that you can adjust and some that don’t allow any tampering. We knew that you would not have much success in adjusting the Kashaato. 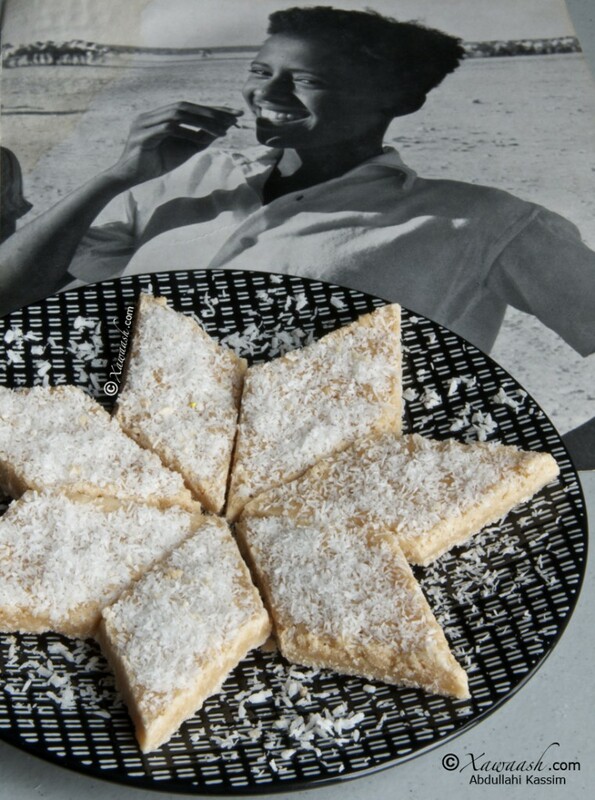 We believe the Coconut Sweets or the Coconut Burfi will be more to your liking. Eid Mubarak to you and all your family. We are happy to know that you like the recipes you tried. Thank you for sharing your experiences with us. God willing, we will post a recipe for peera. thank you so much is it possible for you to post it by satuday or sooner? We are finalizing a post now and another one is in the works. With the amount of work involved in preparing our posts (photograghy, video recording & editing, and writing the post) it is not possible to make that recipe at such short notice. We will do our best to post it in the near future. Thank you for understanding. We are working on meeso now and we hope you will like it. We are trying our best to post it by tomorrow night Toronto time. Happy Eid. We will post it soon, God willing. Here are the ingredients you will need: 6 large eggs, 2 1/4 cup sugar, 1/3 cup butter, 3 Tbsp flour, 1 Tbsp ground cardamom. Eid Mubarak. You are most welcome Zahara. you havent posted the peera yet? We will, God willing. Thanks for your patience. Please, be patient. There are a few recipes ahead of it. Thank you. how many more recipes untill you make the peera. ive waited since october? First of all, thank you very much for your patience. God willing, we plan to post it very soon before your patience runs out. Waa ka-dhaafi kartaa haddaad rabtid. 200 mL waa hal litir oo shan loo qeybiyay. Waxaan rajaynaynaa inuu kuu hagaago. Waxyaabana kale oo dhan shan ku-dhufo. Asc. Thank you so much walaalayaal for this recipe. Waad yaabi inta goor oo hadda ka hor aan isku deyey inaan kashaato subsado oo eey iga halawdey. Thanks a lot. Hal recipe oo kale aan idin ka codsado. Kashaatadii kale oo lowska (peanuts) lagu sameeyo. Aad iyo aad ayaan kaa u xiisoqabaa oo aan rabaa inaan asxaabteydi u sameeyo lakiin waxaan ka baqaa iney haddanna iga xumaato lool . Mahadsanidiin, qeyr ayaan Alle idin ka rejeeynayaa, insha Allah. W.s. Waan ku-faraxnay inay kuu hagaagtay kashaatada oo aad jecleysatay. Waa ku-mahadsan tahay inaad nala socodsiisay. Hadduu Eebbe idmo waan soo gelin doonnaa codsigaada. Qayr badan ayaan Ilaahay kaaga baryaynaa. Mahadsanid. Thank you so much. You 2 are the best walahi been wanting to learn this and you made it easy for me walahi Shukran. May allah s.w.t bless you both amiin ya rabi and bless you with many more Much loves. Thank you very much for you kind words. We are happy you liked it. Thank you for your special prayer. You can replace it with any flavour you like, or leave it out. walaal waxaan raba inaan ogado siida loo sameeyo chickenka insha;allah no soo galiya side loo shilo , mhadsanid! God willing, we will post peanut kashata. Thank you. Don’t worry, there is no disturbance at all. We understand what you mean, we also call them Kashata za ndhugu. Insha’Allah we hope to post it soon. Aad iyo aad ayaa ugu mahadsan tahay faalladaada iyo ducadaada. Waan ku faraxnay. Meentada caraf ayey u kordhisaa, waa ka dhaafi kartaa haddaad rabtid. Waa ku mahadsan tahay salaanta qaaliga ah iyo faallada fiican. Waan ku faraxnay hadalada wacan ee qiirada leh iyo ducada. Qayr ayaan kuu rajaynaynaa. Mahadsanid walaal. ASC, walal hal mushkilo ayaa i haysata hadaad iga caawin karto, 3times oo kala duwan aa sameyay wee ii toosi la’dahay waxee iga noqoneysaa sidi nac nac luubaani oo kale ee isku jiid jiideysaa, maxee kula tahay inee iga qaldayihiin aad ayaa u mahadsantihiin. Waxaa muuqata sokorta inay kaaga badatay. Koobabka cabirka haddaadan istacmaalin waa adag tahay inuu tooso. Mida kale dabka hadduu ku daaho nac nac oo kale ayuu noqonaayaa. Waxaan rajaynaynaa marka soo socota inuu kuu tooso, Insha’Allah. Waa mahadsan tahay walaasheenna qaaliga ah. Annaga ma naqaan fiidiyow oo af Soomaali iyo af Ingriis ah. Waxaan bahda Xawaash ka codsanaynaa qofkii yaqaana inuu u tilmaamo walaasheenna. Hadduu Eebbe idmo e-mail-ka ayaan kaala xiriiraynaa. Mahadsanid. It adds a nice flavour, but you don’t have to add it. Meento maxaa laga wadaa micnaha af somali miyaa Meento mise waa afka qalaad. Waa caraf sida vanilla-da oo kale. Nacnaca ayaa lagu daraa, cabitaanna waa laga sameeyaa. Af-Carabi waxaa lagu yiraahdaa نعناع. Af-Ingiriisiga-na waa “mint.” Soomaaliya meento ayaa loo yiqiinay.